This one slipped by us last week amid the post TGS 2005 hubbub, but is certainly worth revisiting, as you don’t see that many inkjet printers with their own keyboards. Casio’s CPC-100 is specifically aimed at the Godzilla-sized market for homemade New Year’s cards  since the advent of digital cameras, the Japanese output of these things for sending to friends, enemies and masterless samurai accounts for approximately half of all the world’s illegal logging. 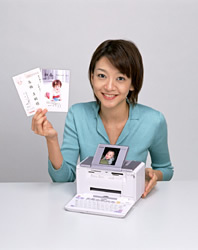 The ¥50,000 printer features that keyboard for adding cutesy greetings, as well as a 3.6in color screen and SD/CF card slots for getting the snaps on there. Its specs claim 2400x1200 dpi, at which res it can print a postcard in under a minute.